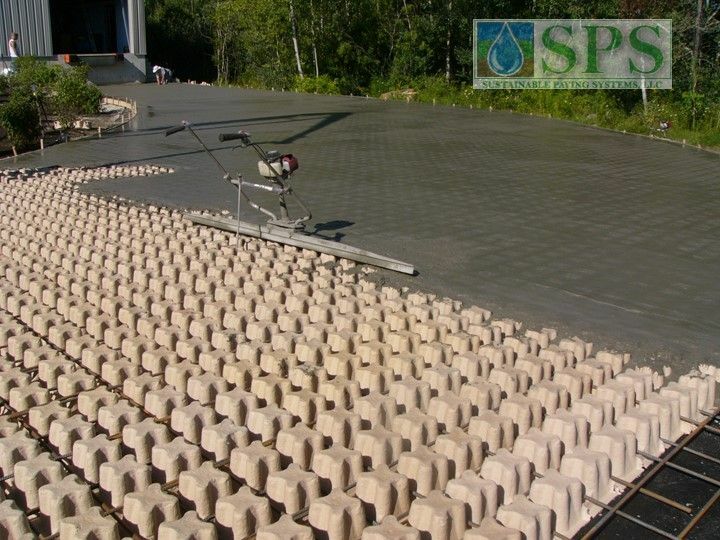 The original installation was specified to use a Grasscrete Stone Filled Void System but the General Contractor determined that the use of Gravelpave2 would be an acceptable equal. The application was a truck dock access road through an environmentally sensitive wetlands area. 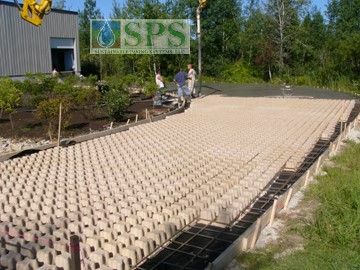 According to the information the General Contractor was provided, the Gravelpave2 plastic ring system not only would accommodate any type or size of vehicle traffic but would withstand continuous use making the system seem ideal for the project. Unfortunately for the end user this proved not to be the case. Ruts began to develop soon after putting the installation into service due to the inability for the plastic rings to adequately transfer the load of heavy trucks and machinery. Once the ruts started, when the trucks had to turn their tires on the system, the little 1” plastic rings began to tear apart. Eventually entire sheets of rings were becoming unbound which were turning up and catching the underside of the trucks making the entire driveway difficult to navigate. Several months after installing the “equivalent” Gravelpave2 product the decision was made to revisit the original specification and install the Grasscrete System as specified. 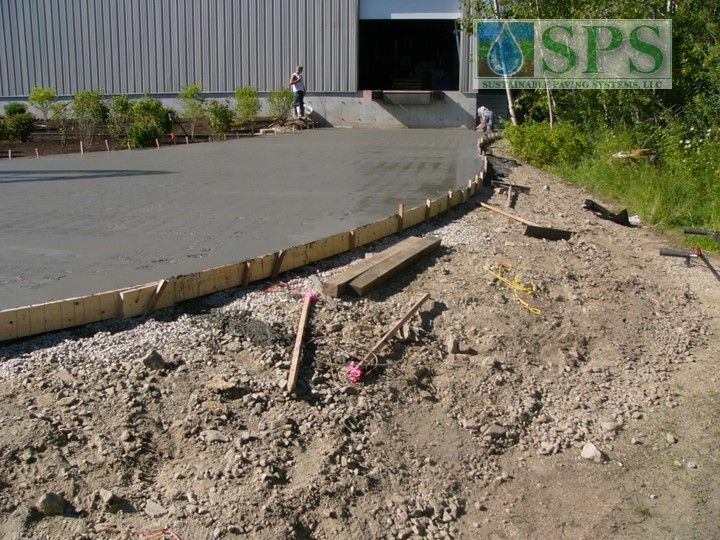 Premier Concrete Construction, LLC of New Hampshire was selected for the installation. 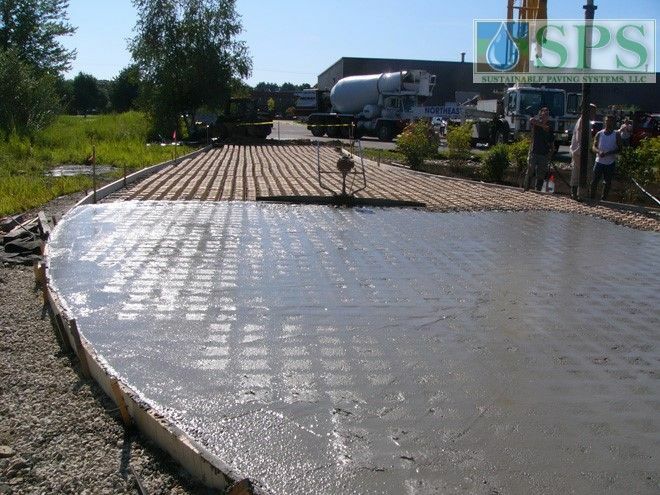 After consulting with the owner’s representative they installed the 5 ½” thick continuously reinforced system in two days using high strength concrete. Once cured for a week the access road was put back into service and is performing as designed. The loading dock access road now accommodates the 40,000 pound trucks making deliveries as well as bearing the weight of a 100 ton capacity crane adjacent to the trucks to load especially heavy pieces of equipment prior to shipping. 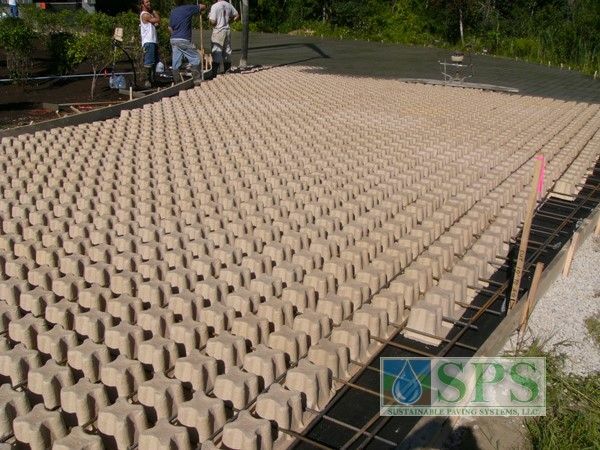 A needle punched filter fabric was installed under the Grasscrete System to minimize the potential for silt to develop in the stone reservoir under the system. The installation uses #3 rebar 8 inches on center with 4000 PSI concrete. 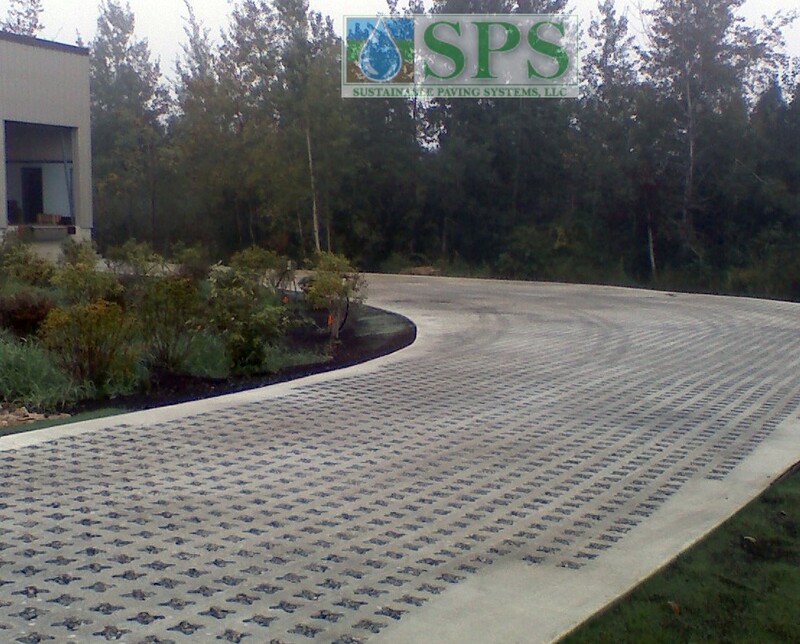 Premier Concrete removed the failed Gravelpave2 system, corrected the grades that had been rutted by the trucks by moving some of the existing sub-base and adding additional clear stone, installed the Grasscrete System and filled the voids with ¾” clear stone. 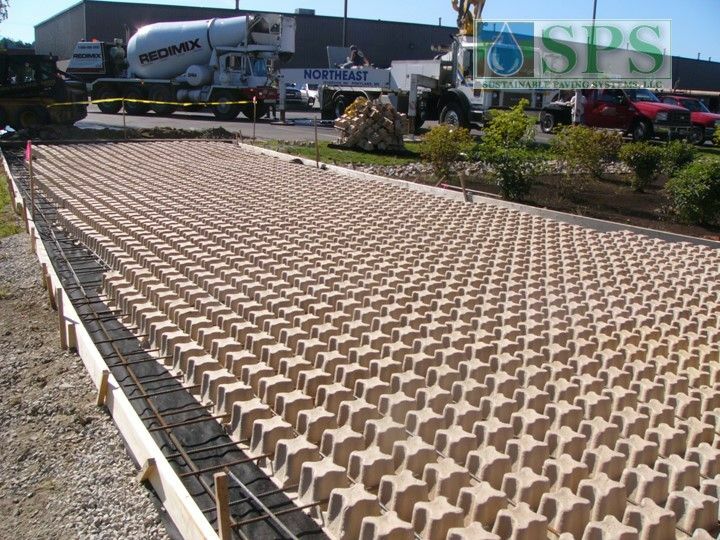 Pervious concrete or asphalt were not options for this project due to their inability to bear the heavy loads as required for this installation. 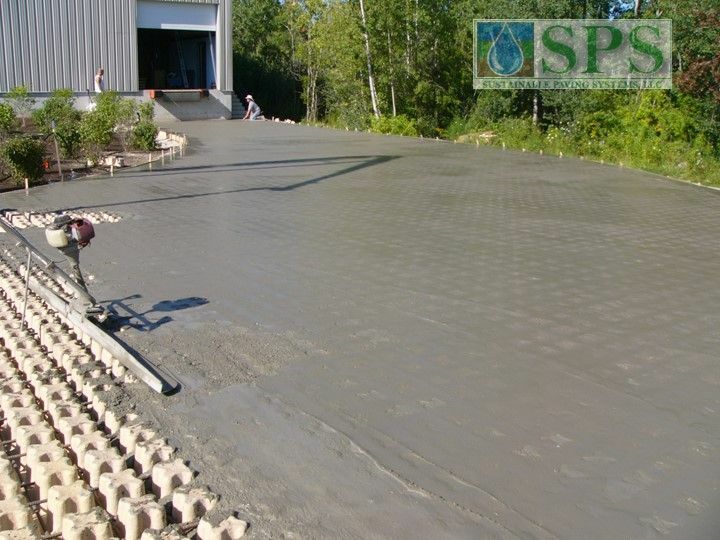 Additionally, there was a concern that additional snow melt chemicals would be required rather than the preferred method of using coarse sand that would clog the pervious pavements unlike the open void Grasscrete System. Grasscrete was the preferred product as well because it has been in use in the New England area since the mid 80’s for similar installations without any issues.